Among new players, coaches and surely fans, the Texas Stars also experienced new rules on Wednesday night. The most noticeable rule change this year is the move to so-called "hybrid icing". Up until this summer, there were two flavors of icing: touch and no-touch. The NHL and AHL were two of the only leagues in the world to still use touch icing. 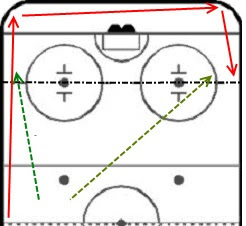 At a basic level, when a player dumps the puck into the offensive zone from the opposite side of the center line and it crosses the goal line without another player touching it, icing occurs. What triggers the whistle is the difference in the two types. 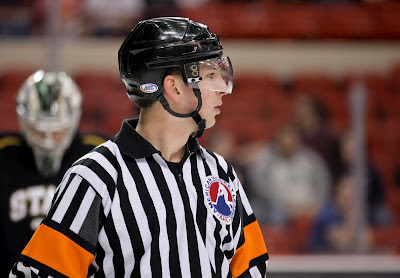 In touch icing, a player from the defensive club must be the first to touch the puck, at which point the referee will blow the play dead and there will be a faceoff in the offending team's zone. In no-touch icing, the play is blown dead the instant the puck crosses the goal line. Safety is the primary motivator for most league moving to no-touch icing. Players trying to "beat out the call" will race with defensemen to reach the puck, often resulting in nasty collisions with the end boards. Hybrid icing, which the AHL is trying out on a limited basis until mid-November, was debuted in preseason games across the league this week. Essentially, in the event of a potential icing violation, should a defending player be the first to reach the end zone face-off dots, the play will be completed, provided the puck has crossed the goal line at that point. This description led many to believe that hybrid icing was a "race to the faceoff dots." However, the linesman is actually making a determination of which player more likely to make it to the puck first. A case where this might apply would be a puck being rimmed around the boards. While the defensive player may reach the dots first, icing may be waived because the offensive player is more likely to reach the puck first. This is a hypothetical example of the above description. If the puck (red) were rimmed around the boards in a clock wise fashion, you can see that the defensive (green) player may be the first to the dots but the offensive player (yellow) would be first the puck. That is what matters in hybrid icing. Watch for the calls tonight to understand more. Tweet me @100degreehockey during the game if you need further clarification on any of the calls tonight.